The disregard and disrespect for the United Nations and the accords, which the US was party to, such as the Iran deal, convey an impression as if the US is planning to undermine, if not destroy the United Nations. Such an idea comes to mind by the appointment of John Bolton, the Stalin-like mustache Ziocon hawk, who said about the United Nations after 9/11: „The Secretariat building in New York has 38 stories. If it lost ten stories, it wouldn’t make a bit of difference“. – Declare to the International Atomic Energy Agency (IAEA) a full account of the prior military dimensions of its nuclear program and permanently and verifiably abandon such work in perpetuity. – Stop enrichment and never pursue plutonium reprocessing, including closing its heavy water reactor. – Provide the IAEA with unqualified access to all sites throughout the entire country. – End its proliferation of ballistic missiles and halt further launching or development of nuclear-capable missile systems. – Release all US citizens as well as citizens of US partners and allies. – End support to Middle East „terrorist“ groups, including Hezbollah, Hamas and Islamic Jihad. – Respect the sovereignty of the Iraqi government and permit the disarming, demobilization and reintegration of Shia militias. – End its military support for the Houthi rebels and work towards a peaceful, political settlement in Yemen. – Withdraw all forces under Iran’s command throughout the entirety of Syria. – End support for the Taliban and other „terrorists“ in Afghanistan and the region and cease harboring senior al-Qaeda leaders. – End the Islamic Revolutionary Guard corps-linked Quds Force’s support for „terrorists“ and „militant“ partners around the world. – End its threatening behavior against its neighbors, many of whom are US allies, including its threats to destroy Israel and its firing of missiles at Saudi Arabia and the United Arab Emirates, and threats to international shipping and destructive cyber attacks. To add insult to injury, Pompeo accused Iran of „assassinations“ all across Europe. All the security brass were surprised, asking themselves what Pompeo is talking. Since the 1990s there haven’t been any assassinations in which Iran could even be considered a suspect. You’ve got the cart before the horse when speaking of Mossad-inflicted assassinations not only in Iran but around the world by using foreign passports of friendly nations. Iran’s president Rouhani rejected off hand these impudent demands, saying „Who are you to decide for Iran and the world?“ In contrast to the US, Iran complied to every jota of the nuclear deal, officially known under its awkward title „Joint Comprehensive Plan of Action“ (JCPOA). Not Iran or the other signatories broke their words, but the US did. Neither can’t their word be trusted, nor their signature has any value. Kim Jong-un should be on the qui vive entering an agreement with the Trump administration. The „Libyan Model“ is already hanging over Kim Jong-un like a sword of Damocles. Shouldn’t Iran turn the tables and confront the US with the following questions and damask US hypocrisy concerning Israel’s substantial nuclear arsenal and biochemical arsenal? – Give the Atomic Energy Agency (IAEA) full access to your military nuclear program. – Stop the enrichment, the reprocessing of plutonium and the processing of radioactive material in conventional ammunition and using it in war zones such as Iraq or Israel is doing in the Gaza Strip. – Allow unrestricted IAEA inspections in your country. – Stop all arms exports, especially to regimes like Israel and Saudi Arabia. – Release all Iranian prisoners and prisoners of Iranian allies and partners. – End the support of terrorist groups around the world (for example, IS, al Qaeda, Taliban, various militias in Syria). – Respect the sovereignty of all countries of the world, and do not interfere in their internal affairs, especially in matters of national security and defense of a country. – Stop all military support for Saudi Arabia and stop the illegal and barbaric war against the innocent Yemeni people. – Withdraw all your occupation troops from Iraq, Syria, Afghanistan, Libya, Saudi Arabia, Germany, South Korea, Japan, etc. – Stop supporting terrorism worldwide and making attacks under the title „IS“ or „Al-Qaida“. – Stop all foreign intelligence activities of your intelligence services, especially secret killer operations. – Stop playing World Police and threaten other countries. Instead, take care of the problems in your own country. You have more than enough of that. Besides these mirror questions to Pompeo’s ridiculous demands, Iran has the right to put the Israeli secret and illegal atomic and biochemical weapons programs under the scrutiny of the IAEA. It’s known that Israel has a massive stockpile of nuclear weapons and a second strike nuclear capability thanks to the submarines, which were given as a „gift“ by Germany. They got two as a bargain price. As long as Israel’s nuclear arsenal remains unspecified, the US and the international community has no right to bully Iran to strip its country and its non-existent nuclear arsenal. Israel has more than 200 atomic bombs, Iran has zero. The problem that the US has apparently with Iran neglects the central question about the elephant in the room, which is Israel and its obsessive Prime Minister. Presumably, he has pushed President Trump in this confrontational position. Under Obama, Netanyahu tilted at windmills, but with Trump, he can play a cat-and-mouse game. In his administration, ardent Zionists and political pro-Israel hawks have a say. 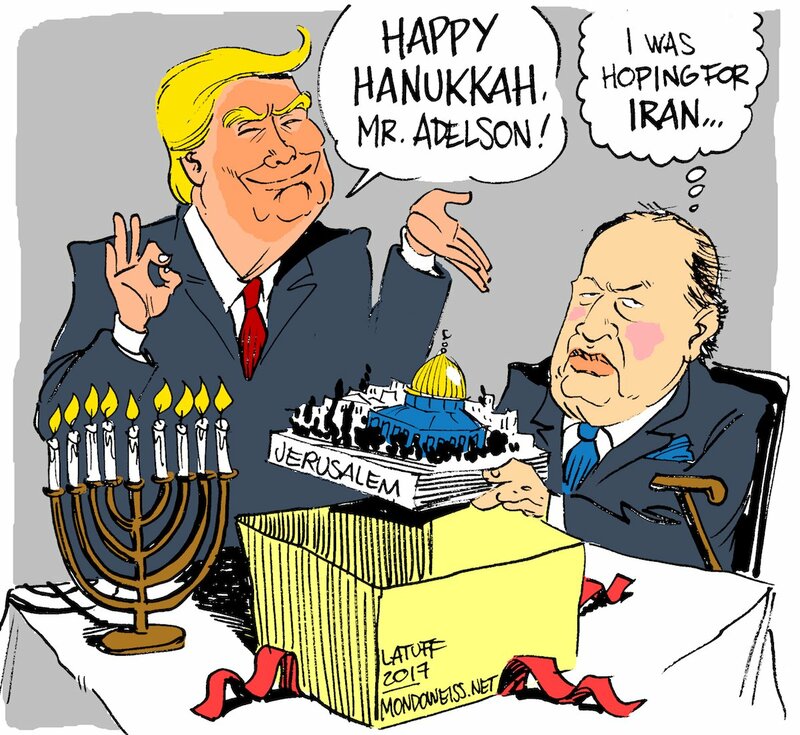 Behind the scene, Sheldon Adelson influences Trump with big donations. For rational diplomacy, the prospects are gloomy. Iran better prepares for war. One can only hope Russia will stick to its words and supply Iran not only with his SS-400 anti-missile system and its other sophisticated weapons that Iran can defend itself against a possible American-Israeli attack.